This is probably one of the more ambitious items on my Christmas present list, but it wasn’t nearly as difficult as I expected, and I quickly got hooked. 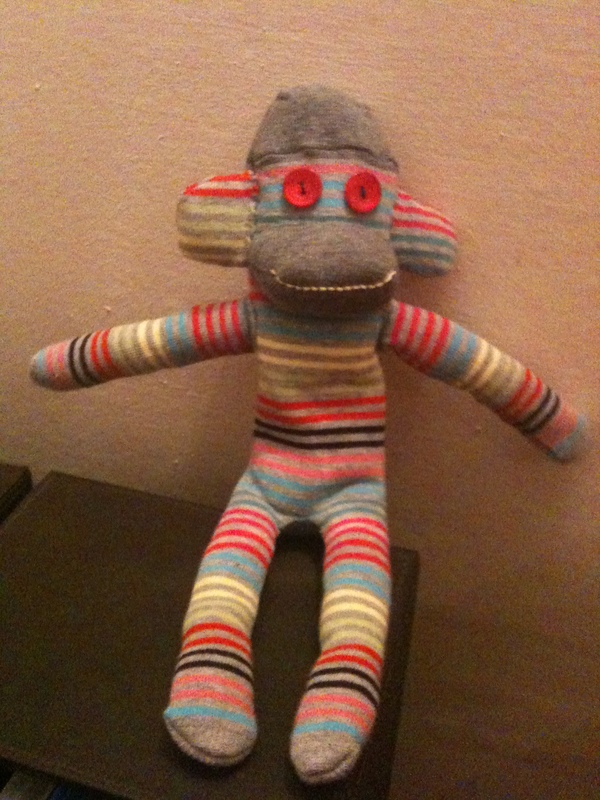 I first saw a sock monkey just a few years ago, although apparently they have been around in America since the 1930s. It was love at first sight, and I couldn’t wait to make one of my very own. I looked around for patterns and instructions and hints and tips, and finally decided I was ready. *Other methods of cutting are available. In particular some (possibly more authentic) versions make a longer tail by using the full length of the sock, but that must also make the arms thinner. Personally I think the half tail length is sufficient, particularly when using adult sized socks, but it’s an option to bear in mind. Now some clever people could no doubt work out exactly how to put their monkey together just using the diagram above. But I am not that good at sewing, so I searched some more and found this excellent step-by-step tutorial. There is a tremendous amount of detail here, which I found extremely helpful. Even after making a number of pretty successful monkeys I still went back to the tutorial every so often to double-check things like the positioning of the nose and arms. 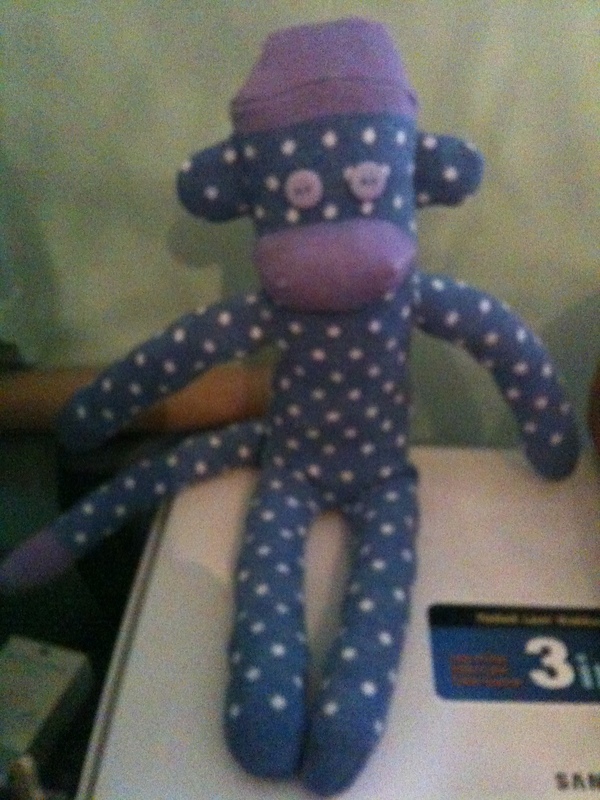 You don’t need a sewing machine to make a sock monkey. I sew all mine by hand, it doesn’t take long. Stripes can be a bit intimidating when you are just starting out. Although it might help you to line things up it also means you can tell when they don’t! Don’t forget that any patterns on the sock will be upside down once you make it into a monkey. 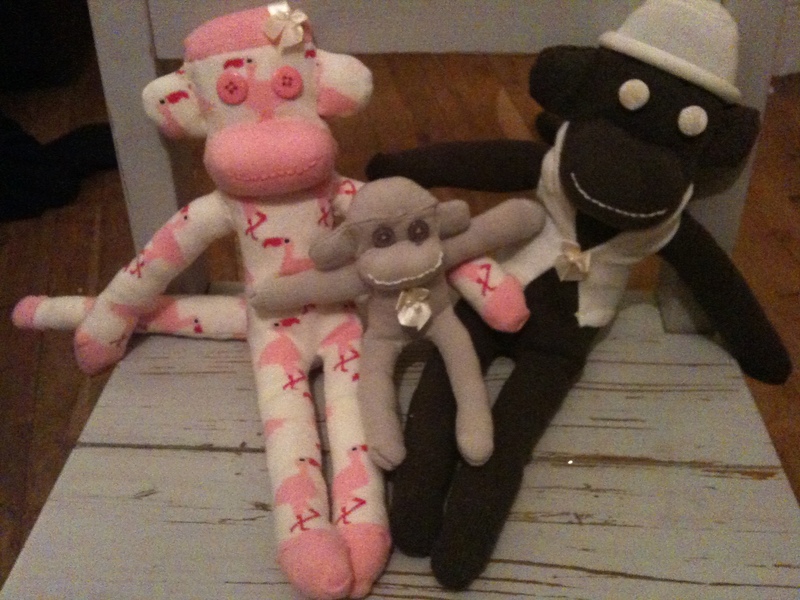 I have made one monkey (see below) using patterned socks, and I did manage to work out how to amend the cutting out in order to stop the flamingoes from standing on their heads, but I wouldn’t make a habit of it. I think it’s worth using decent quality socks. They tend to make the finished article feel softer and cuddlier and are also more forgiving of any little stitching slip ups. In fact, it’s worth using decent quality everything. Your sewing experience and your finished article will be so much nicer if you have sharp scissors, good quality thread and specialised soft toy stuffing. 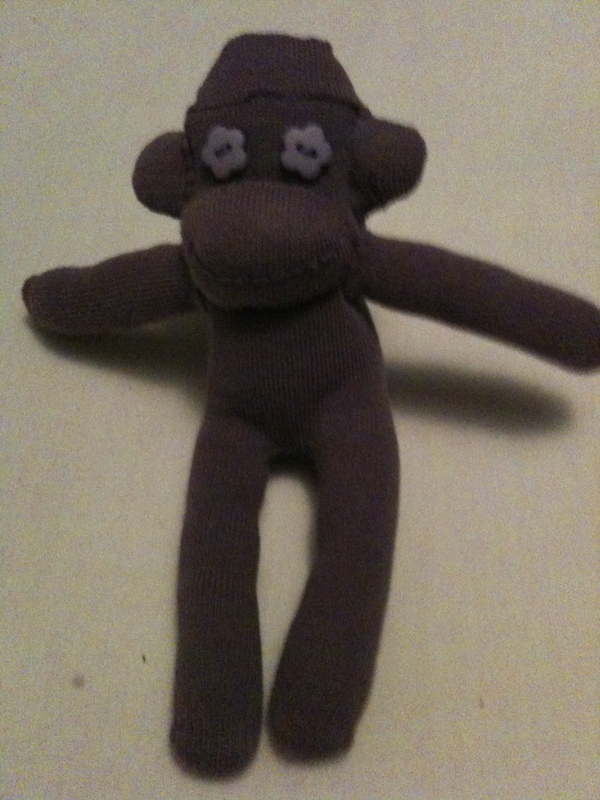 This was my first ever attempt at a Sock Monkey, and the fact that it came out pretty well says something for how easy it is to do. I went for spots rather than stripes, and a contrasting heel and toe. This wasn’t top quality though, made with cheap socks and some stuffing I pulled out of a cushion on my sofa because I was too impatient to wait until I could get to a haberdashers to buy the real thing. There were a few more monkeys between the first and this one, so by now I felt able to cope with stripes. This was made for my teenage niece so I used brightly coloured socks from one of her favourite shops. It does look a bit on the thin side – I have a tendency to under-stuff – but in this case it helps stripey monkey to fit into my niece’s suitcase while she is off travelling. Now it’s time for you to give it a try – but be warned, once you start, you won’t be able to stop. Last Christmas a lot of the presents we gave were handmade (by me.) In fact, most of them were. 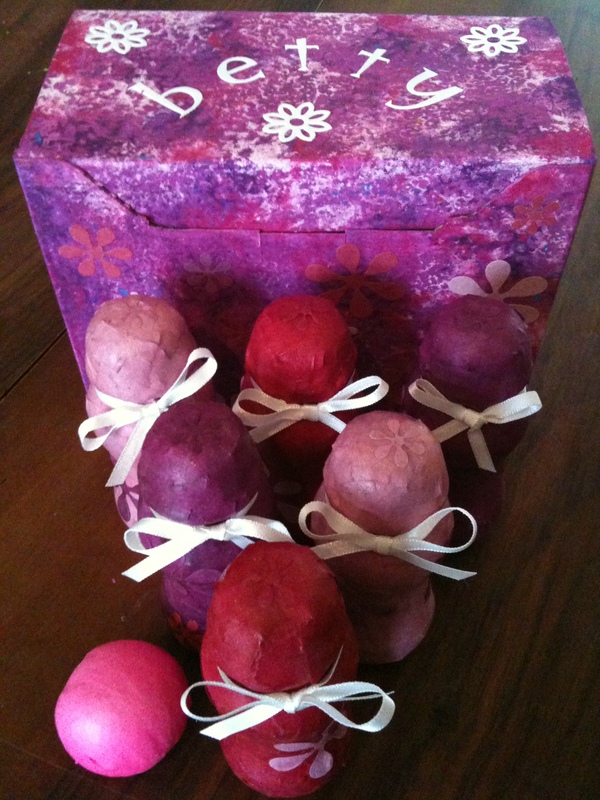 I don’t quite know where the idea for giving only handmade gifts came from. It might have been that I was feeling disillusioned with the whole Christmas shopping experience. In the run up to Christmas, shops are full of things that no-one really wants or will ever use, many of them specifically created to fill non-existent gaps in people’s stockings. Much as I love shopping, I can’t get excited by spending money on something that will end up gathering dust in the back of someone’s cupboard. It may also have been partly prompted by a desire to keep our credit card bill at a manageable level. It was hard work, very time consuming, but ultimately quite satisfying, and – I think – appreciated. 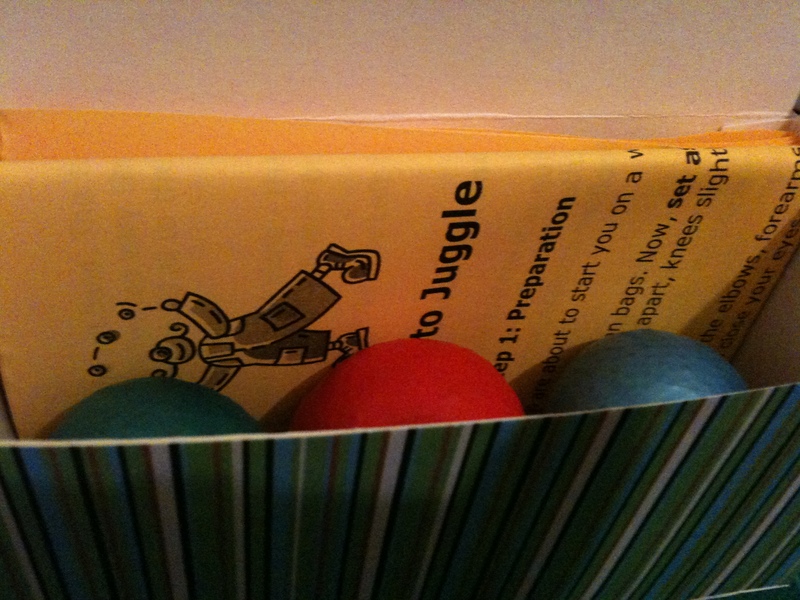 In traditional left-to-right, top-to-bottom fashion, you should be able to see: skittles, colouring books, photo calendars, story books, a cookbook with spice mixes, puzzle books, bath fizzers, flavoured vodkas, marmalade, cupcake flannels, juggling balls, taggie blanket, jingle cube, handmade cards, photos, paper wallets, pen pots, apron, car seat tidy, “moment of calm” bags, seed paper shapes, cookie mixes, mobile phone holder, book safe, sewing kit, handbag bra, folding bag, pints of socks, curry mixes, shortbread, fish seeds, stress ball, record bowls, sock monkeys, surprise balls, and a ring pull bracelet. 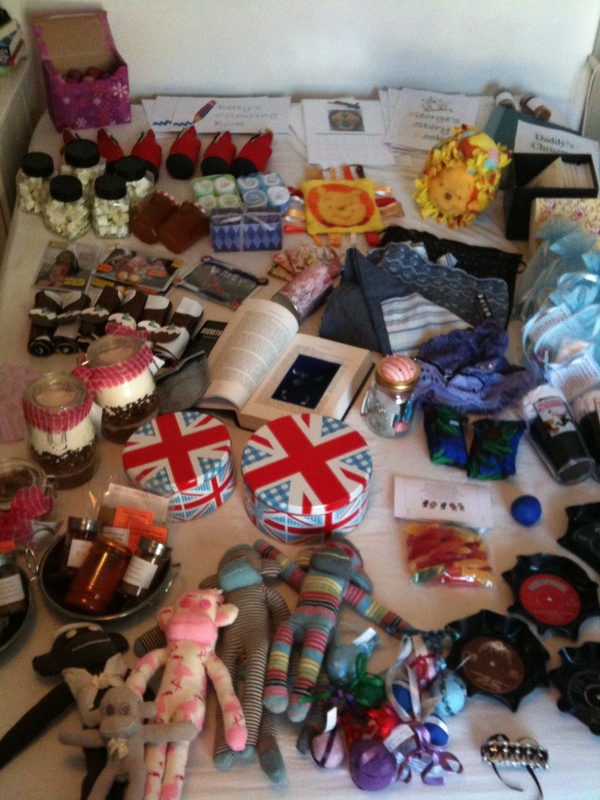 If you feel inspired and want to get started early for Christmas 2011, keep watching. I’ll be posting links, photos, instructions and ideas for some of these creations anon.